You will need some scrap copper and access to a jump cutter. 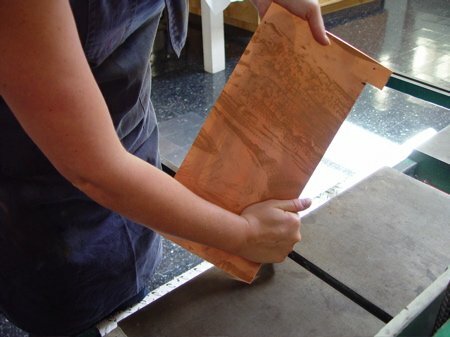 For a thorough discussion of registration technique see Magical Secrets about Aquatint by Emily York, Crown Point senior master printer. TIP: If you want to make a registration bar, you should attempt it after making a successful jig. It is cut and measured the same way but it’s much easier to accidentally cut through because it is such a narrow piece of metal. 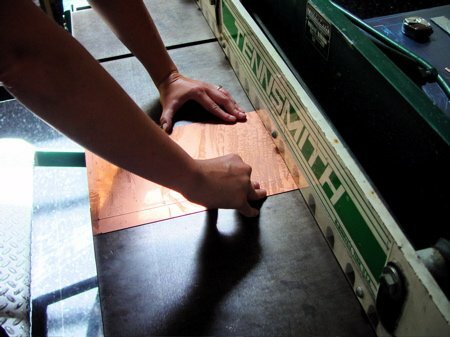 Registration Jig: A rectangular piece of copper with a small tab that nestles between the registration bar and your plate to position your plate on the press bed. The jig is removed to print. 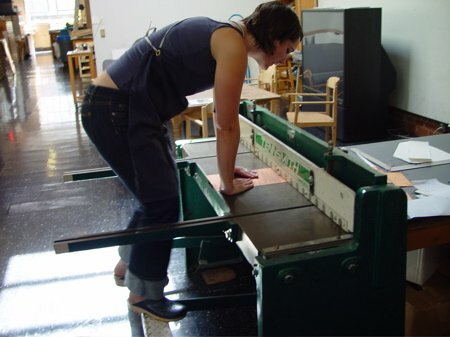 In order to make your own registration jig, first decide where you want your plate on the press bed. It should be roughly centered. Measure the distance between the plate and the registration bar. For this plate we want the registration jig to push the plate out about 7”. 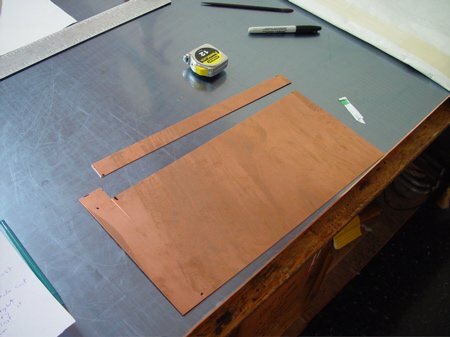 Select a piece of scrap copper about the right size. We recycle cancelled plates. If you choose a piece smaller than your plate you will have trouble with registration. 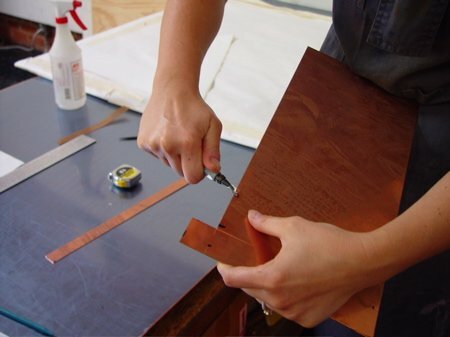 First you will cut down your scrap piece to about the size you will need. Measure down each side. For this plate we measure 8” on each side. 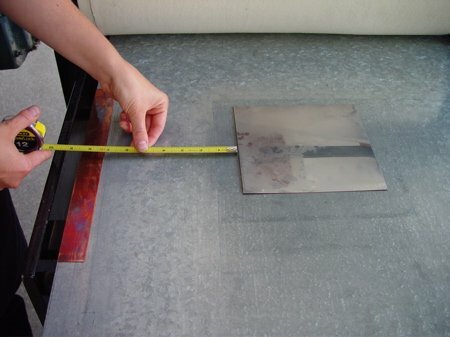 You will cut one inch off the height of the plate to make the tab so add one inch to begin with. 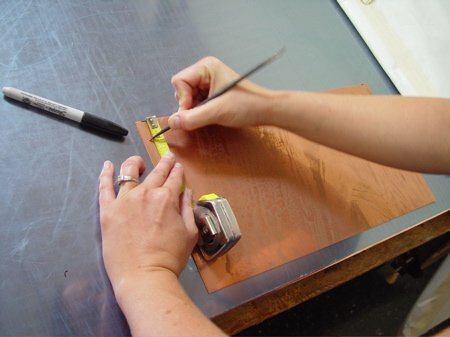 Make your mark with a drypoint needle for accuracy. 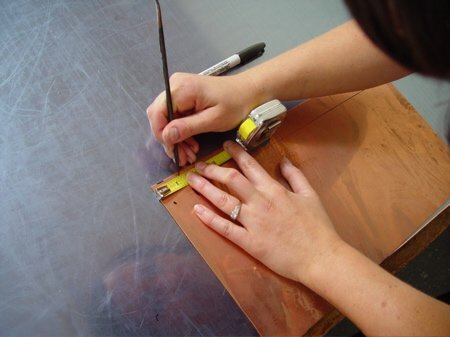 TIP: Use a sharpie to highlight your measurement marks, so you don’t confuse them with other marks already on the plate. Line up your marks on the jump cutter and cut down your plate to desired size. Now you will cut a strip out of the top of your plate that will create the tab that holds the plate in place. 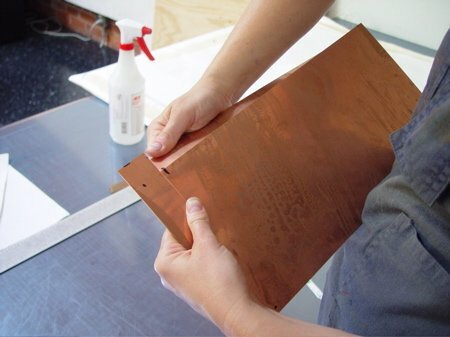 Measure and mark 1″ in on both sides of the plate to make your next cut. You are not trying to cut all the way across the plate. Stop cutting across the plate when you have about an inch of the plate that has not been cut. If you do accidentally cut all the way through, you can just measure it again and make your registration jig smaller. Next Measure about 1” on both sides of the top left corner. 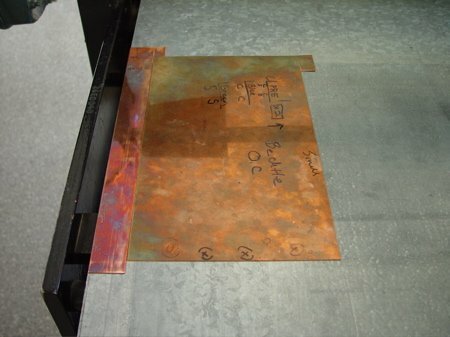 Keep in mind that the next cut you will make will remove the strip of copper hanging from the jig. Make sure this cut is far enough in to release this strip. 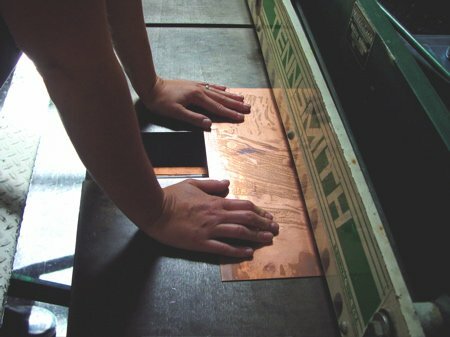 Now hop gently on the plate cutter to make the second cut that releases the strip of copper. 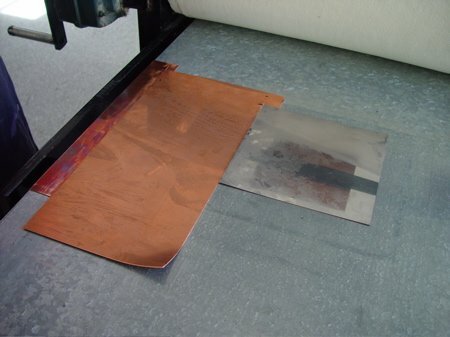 You will probably have to have to pry this strip of copper off. Now you need to deburr the all the exposed edges with a deburring tool, because you’ll be handling it a lot. To make it nice and easy to remove the jig once you have used it to position your plate, bend up one of the corners. 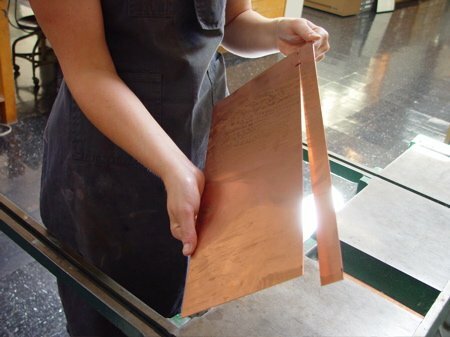 Copper is more flexible than you think. Use a hard surface, and apply pressure. Take your new jig back to the press, and place it between your registration bar and your plate. Remove the jig and the plate is positioned to print. The registration bar remains in place. To use your new registration system, nestle the corner of your registration jig into the registration bar and then fit your plate into the corner of the registration jig. 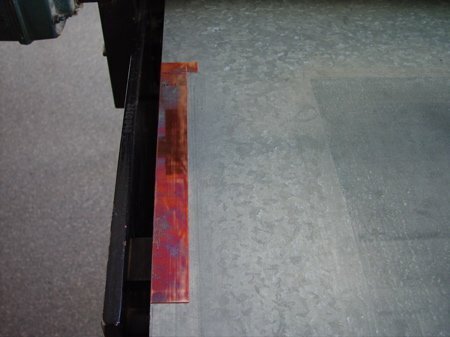 Before printing the plate, remove the registration jig from the press bed. 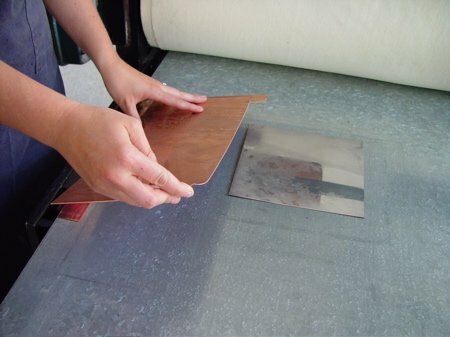 The final chapter in Magical Secrets about Aquatint details all of the information you will need to create a multiple plate print using our registration system. Alternatively, you may purchase a registration jig directly from us if you don’t have the tools to make your own.